The Novitiate poses with (L-R) Bro. Michael, Bro. Jewel, Bro. Joseph, brothers of the Fathers of Mercy. Missing are Sr. Martha and Mariam. Yesterday we had a wonderful visit with Bro. Joseph and 2 other brothers of the Congregation of the Fathers of Mercy. Several weeks ago Sr. Mary Catharine received a package from Bro. Joseph which gave information about Family Vocation Days, a ministry which he founded and which is taking off in parishes in CA, CT and other states. The Brothers shared about their congregation, the Fathers of Mercy, their own vocation stories and how the Family Vocation Days came to (with lots of help from the Holy Spirit). We had a wonderful time sharing about the gift of vocation, appropriately enough, on World Day of Consecrated Life which is celebrated annually on Candlemas Day. We encourage you to consider asking your Pastor if your parish could host a Family Vocation Day. 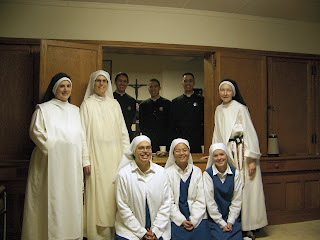 This ministry is not only about educating families on the beauty of the religious life and priesthood but also about helping families rediscover the beauty of their own vocation and how that is lived out through the family praying and celebrating together. "The objective of the vocation days is two fold: first, to pray, to familiarize, and to catechize the faithful in the topic of religious vocations, i.e. the priesthood and the consecrated life; secondly, to help families answer the universal call to holiness. All people regardless of vocation, age and gender, are invited to come and experience the vocation day." Pray for the sucess of this new endeavor, that the Lord will bless families and that the Holy Spirit will inspire many more men and women to follow Christ!